My Mom's Best: Thank you Boss! 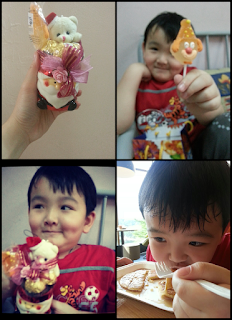 My son is very happy that he received this Christmas gift and it is from my dear's Boss. He ate the clown candy happily and I asked him for a picture with this gift. Last picture you see, he is enjoying his pancake for breakfast. It is a long day, I helped my sister-in-law to purchase her Loccitane. She bought the set that comes with a pink bag of Loccitane, she is attracted to the pinky bag. I didn't purchase anything from the shop, I just browse around. Have you purchase anything for your loved ones or yourself this coming Christmas? Looks like there is no doom day for 21 December 2012, but it is rainy day I can still hear the thunder and rain outside.